Going to be in Austin, Texas for South By Southwest? Blogger is! And we're throwing a party with our friends from Google Reader. Come, drink, and talk blogs. Party is at Six Lounge (117 W 4th St @ Colorado) on Sunday, March 15th from 10pm - 1am. 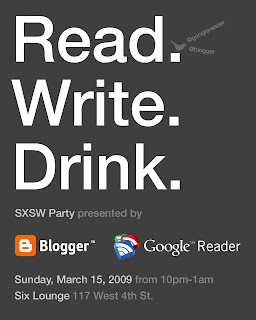 Bring your SXSW Interactive Badge, or find a Blogger or Google Reader team member at the conference and ask for an invitation. You'll recognize us by our schwag. Plinky: An answer to "blogger's block"
" suggests that more than a few of you have struggled to think of what to say on your blog at one time or another. If that sounds like you, you might want to take a look at Plinky. Plinky is the brainchild of one of the original Blogger team-members, Jason Shellen, and we've enjoyed seeing what people have come up with in the first few weeks of answering Plinky prompts. Every day we provide a prompt (i.e. a question or challenge) and you answer. We make it simple to add rich media and share your answers on Facebook, Twitter and blogs. Not only does Plinky provide help with what to post to your Blogger blog, but it also helps your answers look good in the process. Depending on the prompt, answers contain rich media elements like maps, photos, lists and cover art for books, movies and albums. It's easy to tell Plinky that you use Blogger and all your answers posted through Plinky can go right to your blog. The fact that there are tens of thousands of results for "blogger's block" suggests that more than a few of you have struggled to think of what to say on your blog at one time or another. If that sounds like you, you might want to take a look at Plinky. Plinky is the brainchild of one of the original Blogger team-members, Jason Shellen, and we've enjoyed seeing what people have come up with in the first few weeks of answering Plinky prompts.